The Dolphins must bounce back in Week 5 to keep pace with the undefeated Patriots in the AFC East. — Wide receiver Danny Amendola might play on Sunday, writes Morgan Smith. — The undefeated Patriots are underdogs for the second consecutive week. — Quarterback Geno Smith imploded on Sunday in the Jets’ blowout loss to Tennessee, writes Andy Green. — The Jets will add former Bills wide receiver David Nelson. — Safety Jairus Byrd practiced in full for the Bills on Tuesday, while running back C.J. Spiller sat out the workout. — Join the staff at Bills Gab today! — Were the Dolphins exposed as a pretender against Saints? — Dolphins vs. Ravens: Who Has the Edge? 1. New England Patriots (4-0): Love them or hate them, you have to admire the model of consistency the Patriots have displayed. Just when it looks like they are slipping, they go on the road and beat a tough Atlanta Falcons team. 2. 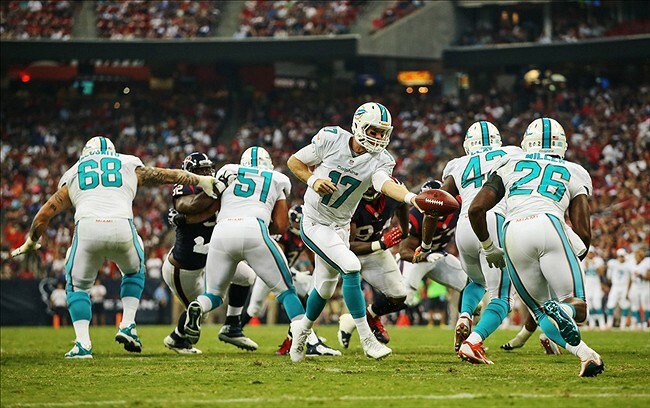 Miami Dolphins (3-1): The Dolphins were humbled on national television in New Orleans. But the Saints are capable of putting a beatdown on just about anyone, playoff-caliber teams not excluded. It will be very interesting to see how Miami responds versus the Ravens on a short week. 3. New York Jets (2-2): I’m not sure the Jets will end up having a better record than the Bills this season, but they have beat them head-to-head, which is why they still get the edge in our power rankings. 4. Buffalo Bills (2-2): Buffalo’s defense dominated in their Week 4 win over the Baltimore Ravens, forcing five Joe Flacco interceptions. Will they begin to show some consistency against the suddenly upstart Cleveland Browns on Thursday night?